Looking for green alcoholic drinks for St. Patrick's Day that aren’t beer? How about trying something a bit more sophisticated without all that gluten – a Sparkling Green Sangria? This green St Patrick Day drink recipe is perfect for parties, especially if it’s warm where you live. There's nothing better than sangria when it’s hot out! I especially like this green Moscato sangria recipe because it’s on the better for you side as it features cucumbers, grapes, and apples. 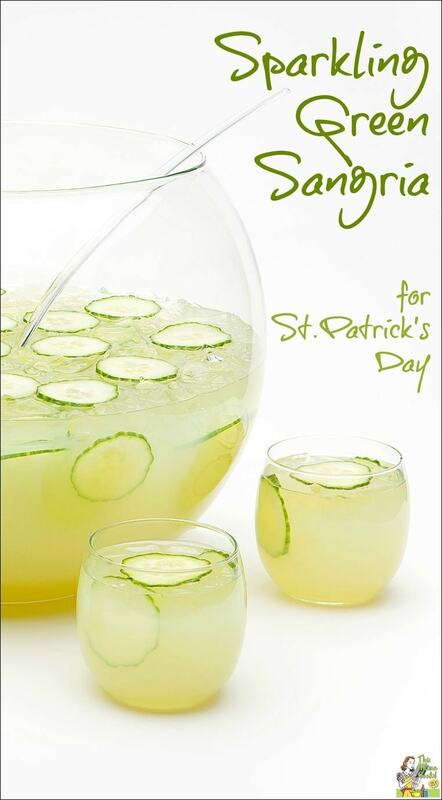 Also, the calories in this green St Patrick Day drink recipe are reduced by adding club soda to the green drink mix. It’s almost like a spa drink, but with a little Moscato wine added. Use large ice cube molds – either square ice cube molds or frozen ice ball makers – and freeze fruit and some wine (instead of water) inside the ice cube molds ahead of time. This will keep your green St Patrick Day drink recipe cooler longer. Using wine instead of water means your Sparkling Green Sangria won’t be diluted, too. No one wants a watery green cocktail on St. Patrick's Day! Also, serving this green cocktail in a punch bowl means that you don’t have to make St. Patrick's Day cocktails to order. That way there's no need to play bartender at your party and miss out on all the St. Patrick's Day fun! 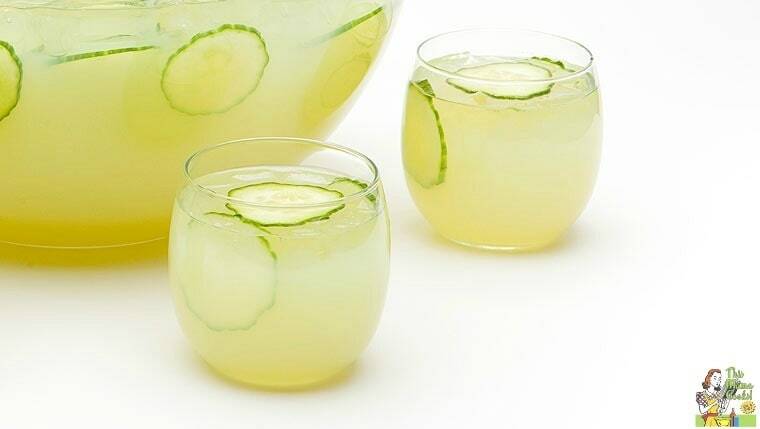 Pour wine in a pitcher or bowl and add sliced cucumber, grapes, apple, lemon and lime. Next add Triple Sec and stir gently. Before serving, top with club soda. Stir gently and serve over ice. Originally published on March 15, 2012 and February 16, 2016. Updated with new pictures. Recipe and picture courtesy of VOGA Italia Wine. Previous post This St Patrick Day cupcake recipe comes with a surprise! What would you use to make a virgin green sangria? You could use ginger ale instead of the wine and a little OJ instead of the Triple Sec. This recipe sounds amazing minus the moscato. What are your thoughts on using procesco and either taking out the club soda or using less as proseco is already very bubbly? Moscato would be fun, too. The point of the club soda is to lower the calories and make it less boozy. So I’d keep it in. when do you add the grapes? Eeeek, that got left out of the instructions! I’ve corrected it. The grapes should get added with the rest of the fruit. Thanks for pointing that out Mitzi!! I want to try thus recipe -can I sub the club soda with Sprite or do U think it will he too sweet tasting? Sue, it’s supposed to be a somewhat healthy drink! (Ha!) I would stick to club soda or one of the flavored seltzers – so many to choose from that are healthy and delicious. Sprite would be too sweet and have too many calories! You never followed through with directions for the grapes…should they be chopped as well? They can be whole or chopped in half. Up to you! This drink is right up my alley besides the Moscato, could I sub that for Pinot Grigio? Tiffany, Moscato is a bit bubbly and sweet. But I bet Pinot Grigio would be good too, just a little different. What size bottle of Moscato wine did you use? Good question Kalley! Each bottle is 750 ml. I’ve updated the recipe to show that!